It is with a heavy heart that I share the news that our good friend and INANE colleague, Dr. Margaret Comerford Freda, Editor Emeritus of MCN, died early this morning (April 27) at her home in New York. Margaret had been ill for several years, stemming from a diagnosis of giant cell arteritis in the fall of 2011. She faced numerous health complications and setbacks with strength and dignity, always professional and always composed. She is an inspiration! 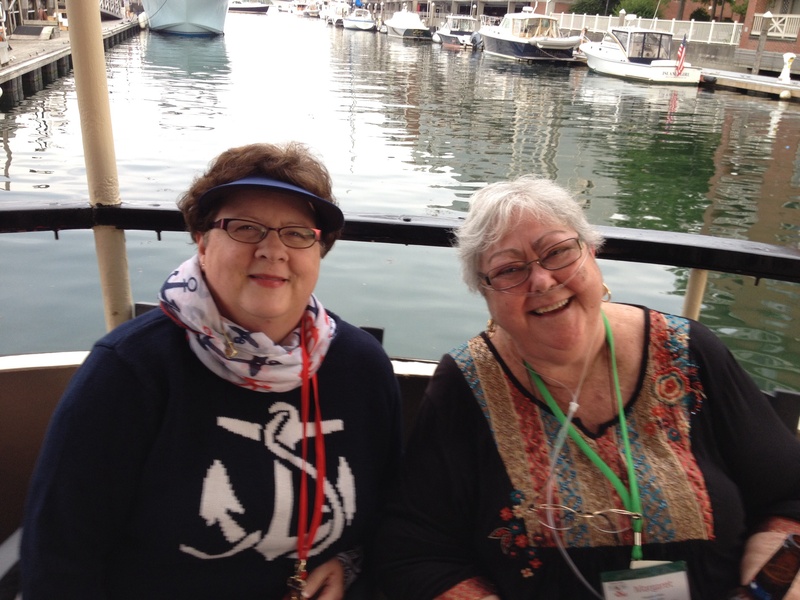 As the Chair of last year’s INANE conference, it meant more to me than I can say that Margaret was able to make the trek from New York to Maine to join us for our meeting. She fully participated in everything, including the boat trip to the lobster bake on Tuesday night, as you can see in the picture above! It was a joy for me to be able to sit with Margaret for many of the sessions, particularly our closing poet, Richard Blanco. I will freely admit that we both sobbed our way through his presentation! Margaret was so invigorated by her attendance at INANE–in her words, “I found my professional self again after being a patient for four years,”–that we took on the challenge of revising The Editor’s Handbook, first published by Lippincott, Williams, & Wilkins in 2010. Again, as Margaret said to me, “I am not able to walk much, and I don’t breathe very well, and some days I can’t even talk–but I can sit and think and write.” She was fully engaged throughout the revision process, taking the lead on all ten chapters by revising content and updating references. Margaret also reviewed every single page in the first round of page proofs, meticulously noting tiny errors and making sure everything was correct. I knew she had had another health setback in the past two weeks. When I received the second round of pages for review last week I thought she might not be up to taking this on–but in her ever gracious way, she apologized profusely for “dropping the ball…I am so sorry, but my vision is so blurry right now…” Margaret, please know, you did not drop the ball! I am so proud to have your name above mine on this book when it comes out this summer! Margaret and I first became friends when she was appointed Editor-in-Chief of MCN: The American Journal of Maternal Child Nursing in 1997, and my name was suggested as someone who might have some useful advice. I suppose I did have a few tidbits to share, but I think in some ways, I benefited more in learning from Margaret. She has taught me so much! It was a wonderful honor for me last year to have her be my sponsor (with Marilyn Oermann) for my successful application to the American Academy of Nursing. Margaret was so disappointed that she was not able to be present for the Induction Ceremony, but truly, her generous spirit was with me all that weekend. Margaret’s leadership in INANE is well known, from serving on several planning committees and chairing the conference in 2004 that was held at the Atlantis in the Bahamas. But I think she will always be remembered as the David who took on the Goliath of Impact Factors, paving the way to have nursing journals and nursing knowledge recognized in the Web of Science. When Margaret, along with Dr. Judy Lewis spearheaded this project in 2004, there were 33 nursing journals indexed in this database. Now there are 115. She was so proud of this accomplishment! The Margaret Comerford Freda Award for Editorial Leadership in Nursing was established in 2011 and awarded to Margaret herself in 2012. Those of us on the committee that year had an easy job–she was the unanimous choice. To be honest, many of us were afraid that she wouldn’t be with us to accept the award that year, but she was–not in person but with us all the same. At INANE last summer, it was a thrill to have Margaret present her eponymous award to the 2014 winner, Dr. Peggy Chinn. Plans for a memorial and so on have not been finalized; as soon as I have any information I will share with everyone here. In the meantime, I am sure Margaret’s husband John and her children and grandchildren would find great comfort in reading any memories or thoughts people want to share in the comments section of this post. This entry was posted in Discussion, In Memoriam by Leslie. Bookmark the permalink. I am sorry to hear this sad news. Margaret was so kind to me as a new editor and I am happy to have had the opportunity to meet and talk with her in Portland. In our brief (30 minute) conversation she answered my long list of questions and spoke with me several times by phone when I returned home and had other questions. A lovely person. My sympathy to her friends and family. What a beautiful tribute to Margaret. She had a most amazing, inspiring spirit of love and generosity. To me, she lived the values on which nursing is founded. We will miss her terribly but I am comforted by the memories of the moments I shared with her. What a wonderful commentary Leslie – thank you from all of us who knew Margaret and admired her greatly. The picture is the perfect visual memory of her in Portland. I think it’s quite remarkable that she was alive to participate in the award made in her name and in her honor. So often we make gestures honoring our colleagues after they have left this life, but we did the right thing by creating this award during her lifetime! I have special memories of Margaret. Years ago we were both involved in patient education and worked together on a number of educational projects. We reconnected later as editors. In the beginning of Margaret’s illness, I served as interim editor of MCN and admired her generosity of time and willingness to share. I will remember her laugh and smiles. She gave a hearty belly laugh and told me she would dine out on my comment for years. I was so happy to see her again this past year in Portland. We talked briefly and I went away feeling so honoured to have known her. She will be sorely missed. Leslie, thanks for writing such a beautiful tribute. Last summer was my first opportunity to spend time with Margaret and get to know her a bit. I thoroughly enjoyed working with her and was hoping that I would have more opportunities for conversation and laughter in the future. I’m glad I could answer one of her lingering questions about E.D.care and enjoy a good laugh. She’ll be missed but her presence will always be with us. P.S. Great picture, a lovely lasting image of her! Leslie, thank you for your email on “Remembering Margaret”. It was wonderful to see her at INANE and have the opportunity to visit and reminisce. She was a wonderful colleague and leaves us with many fond memories. Margaret Comerford Freda: the name symbolizes colleague in writing. She always shared her knowledge with others. I sat ahead of her at some meeting and noted that she had a small suitcase with her. It was full of books! She was not taking them somewhere. They were what she planned to read on this particular trip! No wonder she was so wise! She also challenged us last year in Maine to work to get more editors into the American Academy of Nursing. We took up that challenge and are offering a session in Vegas. I now think of this as a tribute to her! She will be missed by many of us! Peace to her family. There are people who make a difference and Margaret was high on the list of difference-makers! Good heart, great leader. The entire nursing community is forever grateful for her work with Thomson Reuters… prying open the door for nursing scholarship’s rightful place in the world of scientific literature. So sad is her passing, so enlightening her presence. Margaret was a wonderful friend and colleague. I respected her, admired her, and loved her. Margaret always worked to mentor and support colleagues at every stage of their professional lives. We can honor her memory best by paying this forward. I shall miss her dearly. I was not prepared to hear this difficult news. Margaret sent me an email a couple of weeks ago telling me her vote for the Margaret Comerford Freda Leadership Award for 2015. She spent some time telling me that it was a hard decision and then listed her reasons for voting the way she did. As with all of my (unfortunately limited) contacts with Margaret, I felt her warmth and could even see her smile as I read her email. Margaret was a true inspiration and she will be missed. Margaret was such an outstanding person and leader who was always striving for excellence and encouraging it in others. Last August she definitely enjoyed INANE and as always made such important contributions to our discussions and advancing our efforts. What a tremendous loss! Yet how fortunate we were to have her as both a friend and colleague. I will also miss her wonderful smile and kindness to others. I’m so very glad Margaret was able to join us in Portland last year. I had a wonderful chat with her on a bench in Freeport during the shopping excursion…a special memory. She was a brilliant editor who took great delight in helping others shine. I am certain she will be with us in spirit in Las Vegas, and all the INANE meetings to come. Leslie, thank you for this well-deserved tribute to Margaret. I remember the 2004 INANE meeting and the discussion about the poor representation of nursing journals in Web of Science and was inspired by Margaret and other’s leadership to get more nursing journals included. Margaret was a great leader and mentor. Our world is less without her. I also had the priveledge of knowing & working with Margaret. We were the only 2 nurses who served on the Board of Proctor & Gamble’s Pampers Parenting Network, & together wrote all the original copy related to pregnancy and birth on the pampers.com website. In addition to her knowledge, expertise, & professionalism…..Margaret was a sweet, kind and caring person. As Editor of MCN, she generously offered me help in accomplishing the steps to have 2 articles published in the journal. Although I’ve not been able to see her in the past few years because of her illness, I’ll miss knowing that she’s not with us any longer! She was someone who was always willing to give and help you out.